You’ve heard about the many charms of Las Catalinas: its perpetually blue ocean and secluded beaches, lush nature landscapes, and year-round warm temperatures. 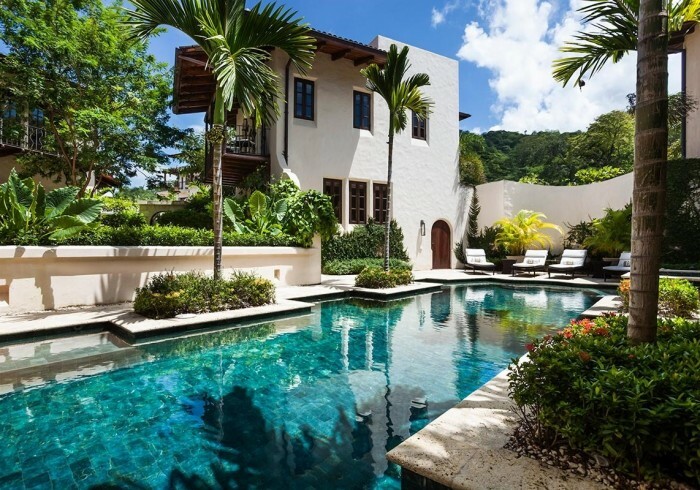 Town founder Charles Brewer calls this stunning three-story villa home, so you might feel like you are staying at the Major’s house. With a gorgeous courtyard and ample guesthouse, it is ideal for a large family or group of friends. If tropical bliss had a name, it might well be Casa Brewer. Whether you spend your days lounging in its lovely private terrace with spellbinding ocean views, prefer daydreaming in its stunning two loggias or entertaining guests in its exquisite poolside grotto, the open-air spaces of this heavenly Costa Rica beachfront vacation rental are such a treat you’d be forgiven if you never came inside this gorgeous home. You would miss its beautiful living spaces, where glam and chic meet warm and friendly. Designed by interior design star Beth Webb, everything here is light, airy, and sophisticated. From its open kitchen and stylish living room to its spacious and enchanting suites, each with an en-suite bathroom, this luxury villa in Las Catalinas, Guanacaste will take your breath away. Add in a local flavor and a personal touch by the homeowners and you’ll understand how this spectacular oceanfront home exudes a feeling of wellbeing. Steps from the sea, Casa Brewer accommodates up to twelve guests and is a treat for adults and children alike.